Sandee Setliff greeting you today. Spring means creation. Like a seed pushing forth out of the darkness of the earth and toward the light, so do we feel the pull out our art supplies and get creative! 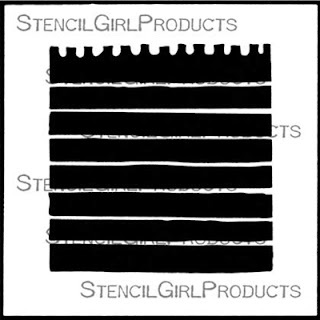 Stencils inspire me to let loose and get creative and I have so much to learn in using them. They are versatile and easy to play with and you can use so many different techniques with them. Today I am creating an art journal page using the Pen and Ink stencil designed by Leslie Riley, Planner Spiral Notes designed by Mary Beth Shaw and I am using watercolors to stencil with. Today's project was spent exploring with watercolors through the stencil for a nice soft washed out effect. Tip: Think before washing your stencil and ask yourself, can I reactivate the paint that is left on the stencil even though it is dried? Mary Nasser has me reaching for maps these days so I collaged some torn strips along the bottom to "ground" my ink pot which was stippled in with some black acrylic paint. I really liked the boldness of the black against the bright pastels. I outlined the letters to emphasize them so they would stand out from the background using a Micron 2 pen by lightly sketching the outline. 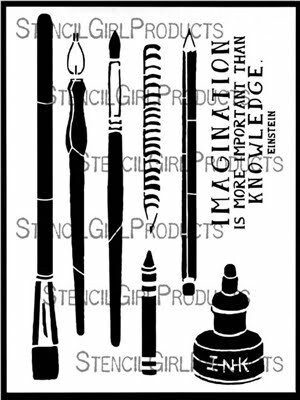 For some added whimsy and to help bring out the calligraphy pen image better I used the Pen and Ink stencil as a guide and outlined it. Then I used the Planner Spiral Notes stencil also as a guide and drew it on the corner extending the stencil and letting it "fade out" over the the right side of the paper. Let your art burst forth like flowers in the spring! Love it. And those stencil are awesome! Sandy you blow up Stencil Girls Stencils with your imagination and creativity!! I love it. Love the collabration of the stencils. I really need the imagination one.. Its got MEKO all over it.. Great job Sandee!